Hello friends and music lovers, it’s Andy Gesner and the HIP Video Promo staff, here to introduce you to a Los Angeles band that’s a natural fit for music video. They’re named after a particularly cinematic image — The Ivy Walls, an evocative handle that suggests separation, beauty, higher education, and the union between the natural and the artificial. The music has a film-like quality too; it’s dreamy, lush, and as romantic as a Hollywood score. The Ivy Walls call their sophomore album The Elegant Universe, and it’s an apt title: this is the sort of set that invites listeners to lose themselves in waves of glorious sound. The band has been likened to other adventurous sonic landscapers: Death Cab For Cutie, Wilco, The Stone Roses, and Broken Social Scene. These comparisons certainly aren’t misleading, but The Ivy Walls have developed a musical and visual aesthetic all their own. Unsurprisingly, their music has drawn attention from filmmakers and television programmers. The spirited “Faster Faster”, the kickoff cut from debut album Lovers In Hotels, scored a recent episode of USA’s hit comedy Royal Pains. “Halloween”, another Ivy Walls favorite, was featured on The Real World Hollywood; The Real World Sydneyaired the Lovers In Hotels title track. The Elegant Universe promises to please Hollywood just bit as much — every one of its twelve tracks feels like the perfect accompaniment for a dramatic scene. But make no mistake — The Ivy Walls is no studio-only act. They’ve become one of the most popular live attractions in the Los Angeles underground, and they’ve made a major contribution to the city’s pop resurgence. “Getaway Driver”, the lead single from The Elegant Universe, is quintessential Ivy Walls: the melody is gorgeous and soaring, the beat is quietly propulsive, the guitar patterns are hypnotic and intriguing, and a velvet-smooth lead vocal performance by singer and pianist Jeff Yanero. 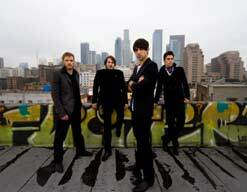 The Ivy Walls frontman is the narrator of the “Getaway Driver” video; he leads his band in action on a rooftop overlooking the Los Angeles skyline. But the real action is going on below, where two smashing-looking girls in carnival masks run through the deserted streets of the Downtown with a purloined duffel bag. Hand in hand, they crash through puddles in back alleys before jumping into a muscle car and escaping to the desert. This is a heist story (and something of a love story, too) and it’s perfectly scored by Yanero and his three talented bandmates and accompanyists. Will Joines (Anthem In, Elika, Sally Shapiro, The Orion Experience’s priceless “Obsessed With You”) directs the “Getaway Driver” clip with his usual sensitivity, scope, and good humor. As always, Joines plays with light: the scenes in the downtown are crisply-shot and ominously shadowed, but the time the girls make it to the Mojave, the frames are flooded with yellow illumination. It’s a metaphor for their emotional states — everything uptight and fraught has melted into a kind of golden contentment. (Turns out they don’t even need the money they’ve swiped: they were after something more elemental than that.) Joines shines some of that light on the band as they play, bathing the rooftop and the Ivy Walls with an irresistibly beautiful golden glow. If you need more info, call Andy Gesner at 732-613-1779 or e-mail us at HIPVideo@aol.com. You can also visit www.TheIvyWalls.com or www.MySpace.com/TheIvyWalls to find out more about The Ivy Walls.